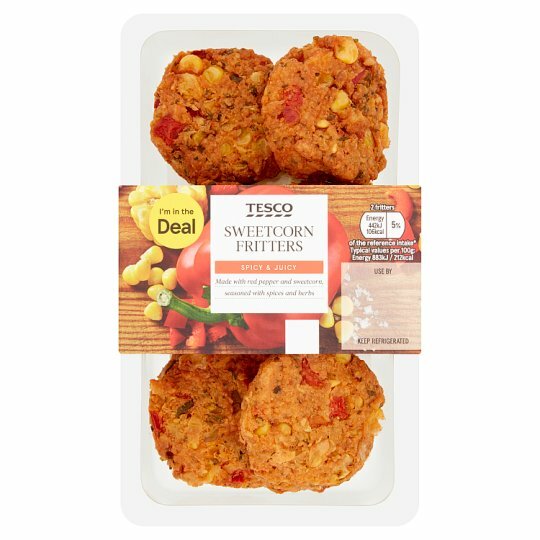 Sweetcorn fritter with red peppers, herbs, chilli and paprika. INGREDIENTS: Sweetcorn (56%), Red Pepper, Onion, Gram Flour, Rapeseed Oil, Wheat Flour (Wheat Flour, Calcium Carbonate, Iron, Niacin, Thiamin), Pasteurised Egg, Cornflour, Garlic Purée, Parsley, Red Chilli Purée, Sugar, Salt, Coriander, Ground Smoked Paprika, Raising Agents (Disodium Diphosphate, Sodium Bicarbonate), Chipotle Chilli Powder, Rice Flour. Instructions: 190°C / Fan 170°C / Gas 5 6-8 mins Place on a baking tray in the centre of a pre-heated oven for 6-8 minutes. Once defrosted, do not refreeze.